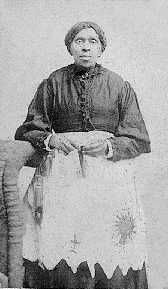 Harriet Powers is one of the best-known southern African American quilt makers, even though only two of her quilts, both of which she made after the Civil War (1861-65), survive today. One is part of the National Museum of American History collection at the Smithsonian Institution in Washington, D.C. The second quilt is in the Museum of Fine Arts in Boston, Massachusetts. The﻿ cotton ﻿quilts consist of numerous pictorial squares depicting biblical scenes and celestial phenomena. They were constructed through applique and piecework and were hand and machine stitched. Powers was born into slavery near Athens on October 29, 1837, and lived more than half her life in Clarke County, mainly in Sandy Creek and Buck Branch. 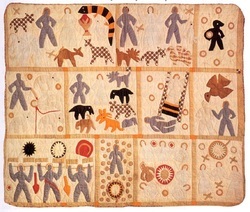 The first of the Powers quilts was displayed in 1886 at a cotton fair in Athens, where Jennie Smith, an artist and art teacher at the Lucy Cobb Institute, a school for elite white females in Athens, saw it.